Solar Wave Modeller: Our Wobbling Star! During a recent discussion I presented a fairly simple application providing an animation of spherical harmonics. The purpose of this post is to address the questions which arose during that discussion. I've already alluded to some of the work we are undertaking in the earlier posting "Dynamics of the Solar Atmosphere Generated by the Eigen Modes of Solar Global Oscillations". The modelling we have described requires us to provide a mathematical description of excitation phenomena which may arise in different solar structures. The resulting formulation is used as an input to our computational models. 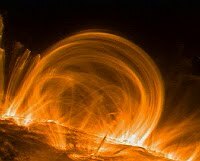 In this post I'd like to begin to understand the global solar phenomena which may provide an important input into our models of solar excitation's. The driver for our model is spatially structured and is extended in a sinusoidal profile across the base of the computational model. Our objective is to run computational models which recreate the atmospheric motions generated by global resonant oscillations. As commented by Christensen-Daalsgard, the earliest observations of motions of the solar surface probably date back to around 1918, the motions which were detected arose from measurements of the changes in the Doppler shift that were observed during attempts to measure the rate of rotation of the sun (St.John C.E. et al ). Since then, observations using a variety of space and ground based solar telescopes clearly demonstrate the diverse range of wave phenomena which are observed in the solar atmosphere. One of the earliest to be discovered was the five minute oscillation, the p-mode. The solar p modes are generated by global resonant oscillations and turbulent motions just beneath the photosphere. The restoring force for these oscillations is the pressure within the different solar structures, variation of the pressure and subsequently the speed of sound determines the dynamics of these modes. The resulting propagation of this wave energy into the solar atmosphere may be used as a diagnostic tool to predict some of the physical characteristics of solar atmospheric structures. In 1960 Leighton presented the first direct evidence for motion tangential to the solar surface this was in addition to the vertical motions which were found with velocities in the range 0.3-0.4km/s, these were observed within a region of scale 3Mm. The vertical motions showed a strong oscillatory character with a period of 296s there were 2-4 oscillations before the vibrations died out. In 1970 Ulrich provided one of the first analyses of these so called 5 minute oscillations, a study of the sub photospheric layers was undertaken. Standing acoustic waves may be trapped in a layer below the photosphere. It was suggested that the power output from these oscillations above the temperature minumum is a significant contribution to the dissipation of energy from the chromosphere to the corona. A study of these oscillations and their interactions enables a determination of the properties of the solar interior. This subject known as Helioseismology has been discussed by many authors two well known papers are as follows. Plm is the legendre polynomial and clm is defined such that integral of the modulus of the spherical harmonic evaluates to unity. l and m are integers which must satisfy -l<=m<=l. The indices l and m are the mode numbers for the oscillation. The mode index n is determined from the radial solutions. Some of these modes are shown below. The p modes with high l numbers are more localized to the exterior of the sun. The so called f modes are gravitational oscillations of the solar surface. Gravitational modes generated in the interior are challenging to detect, these very low frequency modes whose restoring force arises from adiabatic expansion deep in the solar interior are evanescent, their amplitude near the photosphere is significantly reduced making them difficult to detect. 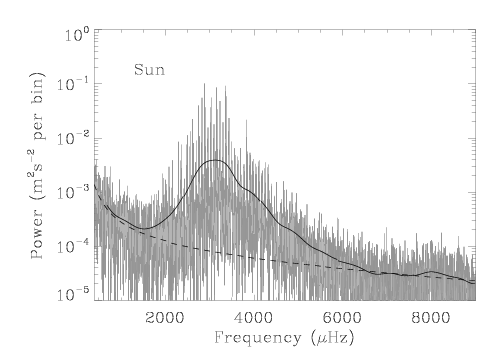 The plot below shows the observed frequency power spectrum of a 5-day segment of BiSON Sun-as-a-star data. The dark solid line is the smoothed spectrum, while the dashed line is an estimate of the background (from Chaplin et al 2008). The picture above show the observed mode velocity amplitudes Vobs (thick grey line) and theoretically computed amplitudes V (dotted line) of the Sun. 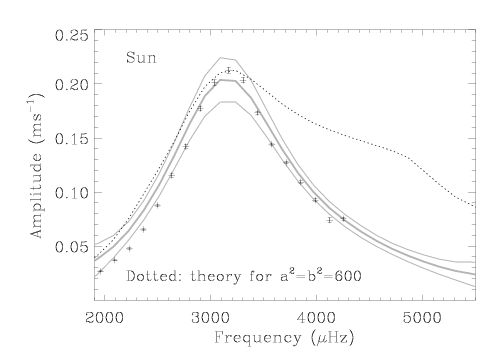 The plotted amplitudes are the mean amplitudes from analyzing 950 independent 5-day segments of BiSON Sun-as-a-star data (from Chaplin et al 2008). Information from the whole surface of the Sun is collected and is then interpreted to find information about the standing waves in the Sun's interior causing it to oscillate. 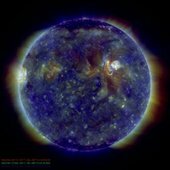 Because some of these modes are formed by sound waves which penetrate into the deep interior of the Sun we are provided with an unprecedented opportunity to study the core regions. Here we have briefly reviewed models enabling us to gain insight into the nature of the wobbling motions of the sun with this knowledge we may begin to understand how the dynamics of the solar atmosphere are influenced by the global eigenmodes. In a further posting we consider the justification for modelling the drivers in our computational study of the solar eigenmodes of oscillation. So far we have used a hydrodynamical model for this study which must be extended to include the complexities introduced by the solar magnetic structures.